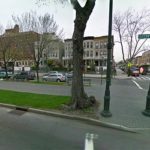 The incident occurred on Brooklyn Avenue near Winthrop Street at around 5:30pm. 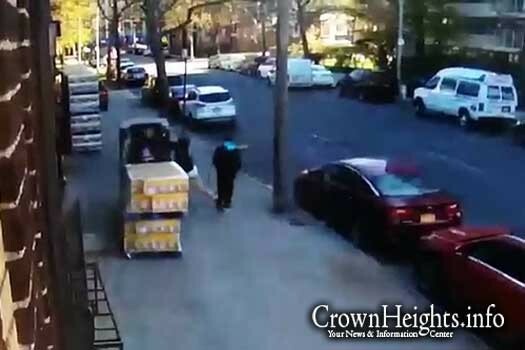 The victim, a 35 year old Jewish man who manages the A1 Paper Goods warehouse at 617 Brooklyn Avenue, was moving pallets with a forklift when he was approached by a pair of teenagers who asked him for the time. The victim took out his cell phone out and told them the time when suddenly one of the teens punched him in the face and the pair began fleeing. Undeterred, the victim sprang into action and tackled one of his assailants and held him until police arrived. He was charged with assault in the 3rd degree and detectives from the Hate Crimes Task Force are investigating whether to charge him with a hate crime as well. “No words were exchanged, there was no attempt to rob the victim leading us to investigate this incident as a possible bias crime” said a police source. The thug who ran into the street almost got run over. A real shame that minivan stopped short. not in deblasio’s nyc. the minivan driver would have been charged with a hate crime. and the whole BLM movement would descend into ch. But hey, At least the cops made an arrest this time. From the video it seems that the the one who the victim caught wasn’t even aware of the punch that his partner gave, as he wasn’t even attempting to flee. He tackled and held the wrong guy. The police are “considering” charging this scum with a hate crime? What are they waiting for, a Black ku Klux Klan? unbelievable. I guess they started with the wrong guy. And by the way Wrong Guy, that’s called an accessory to a crime and punishable too. May be the thug will rat out his brotha in crime.